of wildlife or glimpses of 20,320' tall Mt. McKinley, the roof of North America. the sole vehicle access into the heart of the park. 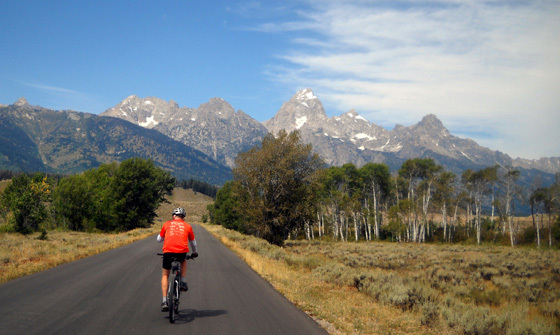 these webpages and our park newspaper should be your guides to planning your trip ." 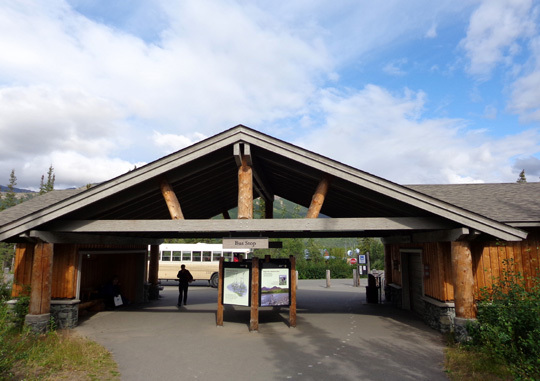 We arrived at the Denali National Park entrance about 1 PM today, after traveling approximately 90 miles up the George Parks Highway from our campground at Denali State Park. 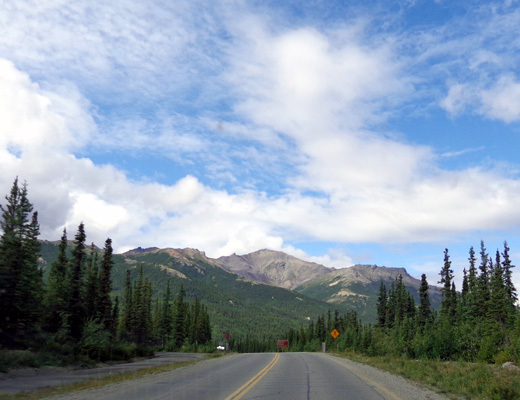 I wrote about that very scenic drive in the last entry and showed views of Mt. McKinley AKA Denali from several vantage points along the way. 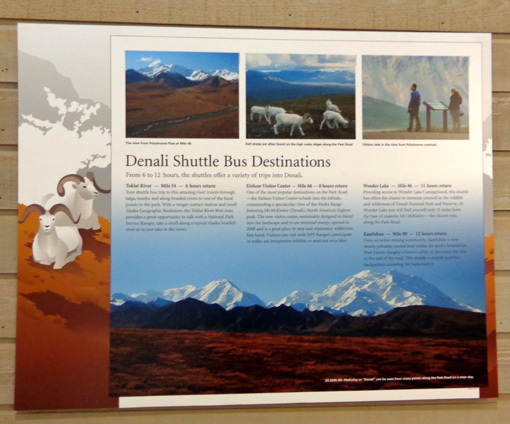 We were excited to finally get to Denali National Park, a place I've had on my "bucket list" for many years. I think it'll be the highlight of our trip to Alaska -- weather permitting. We did a lot of research about the park for the past year so we'd know where to camp (we made those reservations December 1) and what we wanted to do while we're here. Our list is long. Since we are here for only eight nights and parts of ten days, we've already packed Partial Day #1 pretty full. View toward Healy Ridge near the Riley Creek CG entrance; we had lots of sunshine this afternoon. In this entry I'll talk about Riley Creek Campground, where we are staying the first three nights. I'll give some information about the park's other campgrounds, too. 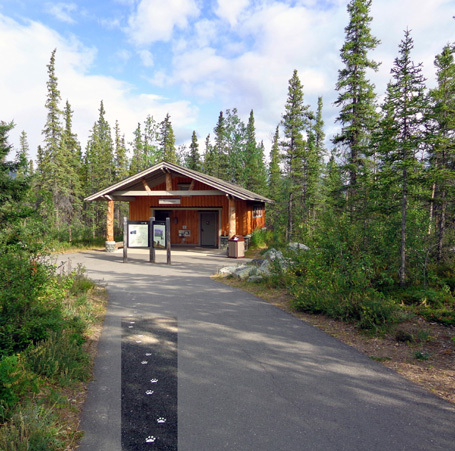 I'll also include some general information about park services, things to do, and how visitors can get around this six million acre wilderness. It doesn't take a rocket scientist to figure out the shuttle, tour, and courtesy bus system, for example, but I guarantee you it can be complicated. 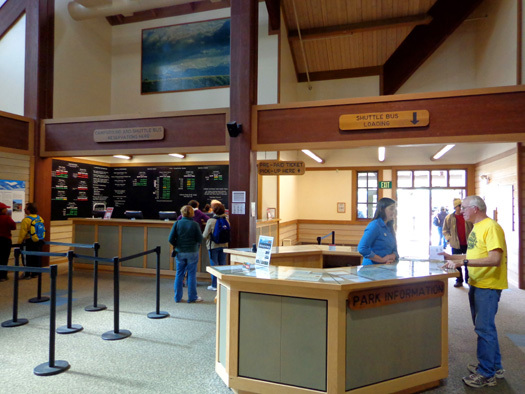 If you're planning a trip to the park it is essential to do your homework first, then supplement what you already know soon after your arrival with a trip -- at minimum -- to the visitor center and Wilderness Outdoor Center to ask further questions of park personnel. No matter the length of time you can spend in the park, you'll want to maximize the experience to avoid disappointment or regrets about what you missed. Let's start with our arrival at the park early this afternoon . 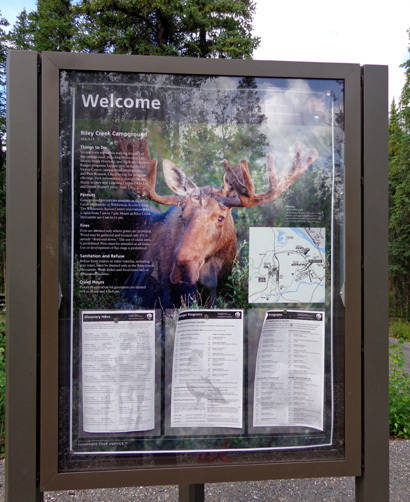 . .
PARK ENTRANCE FEES: WHO PAYS? WHEN? HOW MUCH? 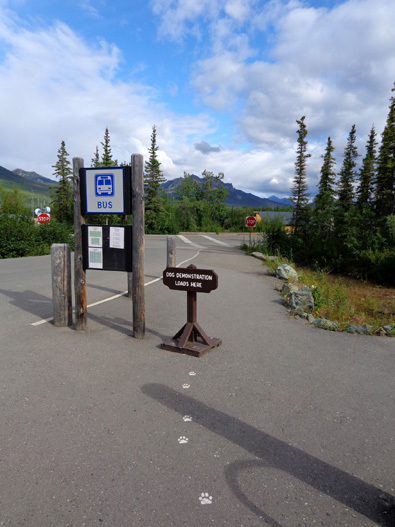 There is no entrance station at Denali NP but visitors are expected to either pay a per person fee ($10 per person for seven days) or show their national park pass at the visitor center upon arrival. 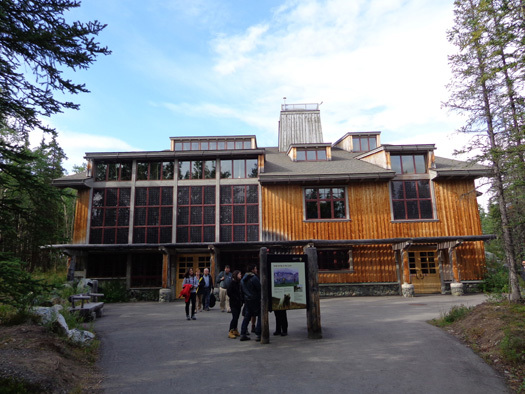 Folks who make shuttle or tour bus reservations for the back country pay the fee when they check in to get their tickets at the Wilderness Outdoor Center. People who are camping pay a $10 fee (good for seven days) for their vehicle at the Mercantile (general store) when they check in for a campsite. 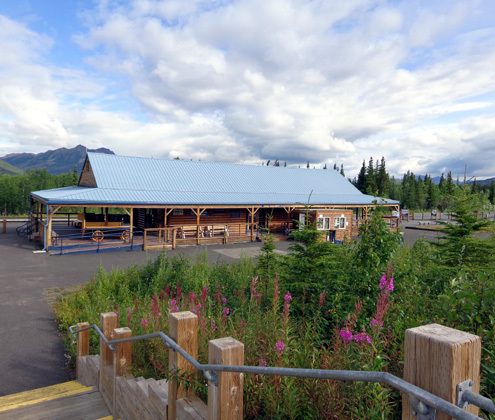 Both of these buildings and the visitor center are within a mile of the entrance to the park. Since we have National Park Service senior passes we paid no entrance fee when we made campground reservations online back in December and we didn't have to pay an entrance fee today when we checked in. Ditto for other visitors with annual national park passes and other valid passes. There is plenty of parking for large rigs when you check in. I showed only part of the parking area in the photo above. Check-out and check-in for the campgrounds are both listed as 11 AM. 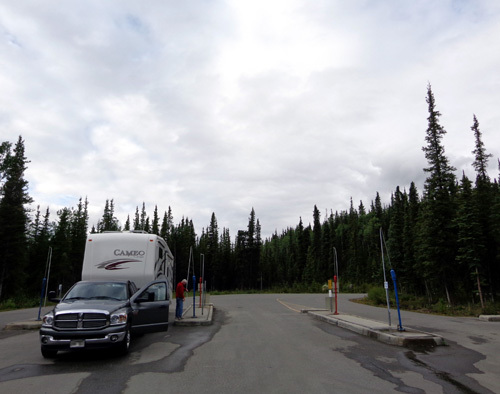 We had planned to get here by 11 AM but were an hour �late� because of our detour to the southern viewpoint on the Parks Hwy. to see Denali-the-mountain this morning. I don�t regret that but it did put us at a disadvantage in getting a campsite. We quickly learned that people come in earlier than 11 AM and take sites that have been vacated earlier that morning. We reserved an �A� site at Riley Creek Campground, which is for RVs over 30 feet in length. �B� sites are shorter. "C" sites are for tents. Some of the A and B sites are double width and some have easier access than others. We learned this from CJ, the campground host, who happened to be in the Mercantile when we were checking in. I started asking him questions while Jim was getting the forms we needed for our three separate reservation time periods. The mercantile consists of two buildings connected by a covered deck. CJ told me most of the large sites were already taken but he thought a couple might be suitable for our rig if they were still vacant. It had been about an hour since he last drove through the campground. 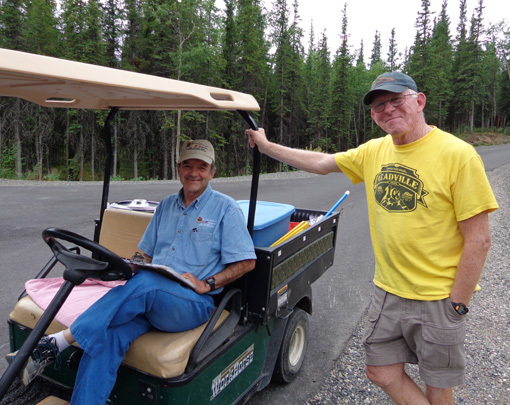 He graciously invited us to walk around the nearby Bear Loop with him to see which sites were still open. There are three loops at Riley Creek Campground. The Bear Loop has the most �A� sites and the ones that are most suitable for big rigs. Above and below: we have a nice big site with plenty of space/privacy on both sides and back. We felt a little guilty taking that site but CJ said very few folks request a handicapped site and it hasn't been reserved for the next three days. We did drive the camper through the middle loop, saw how tight the few "A� spaces were, and went back to the handicapped site. The campground was full enough by late afternoon that the other handicapped spots were also occupied by non-handicapped visitors. CJ said Riley Creek Campground has filled up every night for the last six weeks. Some RVers get lucky if they arrive in the morning without reservations but they shouldn't count on that during the peak season (late May to early September). We liked CJ immediately, and not just because he�s a long-distance runner. He�s also amiable, is a font of information about the park in particular and Alaska in general, and has a good sense of humor. CJ and Jim share a laugh. 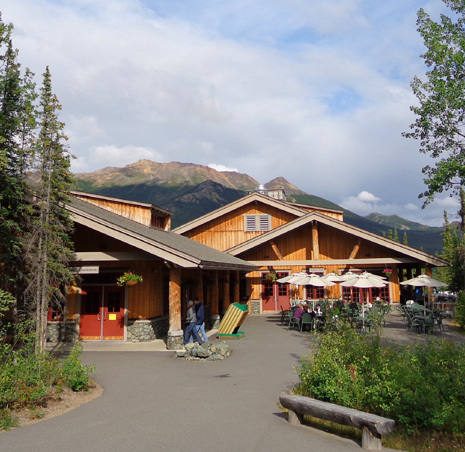 CJ and his wife, Monnie, have been hosting at Riley Creek for three years, at Savage River Campground several years before that, and at a private campground in the area before they got on with the park service (Aramark concessionaire). They are here only in the summer; they have a house and other connections in the Lower 48. We got settled into our site quickly so we could enjoy the rest of the afternoon and evening. Daylight hours still extend late into the evening and we made the best of them. 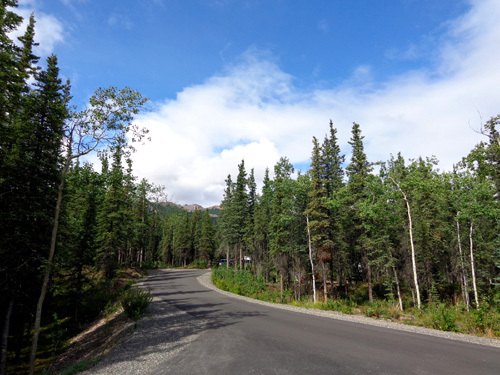 Note that there are no electrical, water, or sewer connections at Riley Creek or the other campgrounds at Denali National Park. That's typical of national park campgrounds. There are restrooms located on each loop at Riley Creek. Showers and a laundry room are located at the nearby Mercantile. It's like a general store with some food, drinks, clothing, camping supplies etc. View down the road from our campsite: no other sites are close to us. The cost this year for the larger "A" sites at Riley Creek is $28/night. We paid $14 (half) with our NPS senior passes. I think "B" sites are $22/night or $11 with a senior pass. 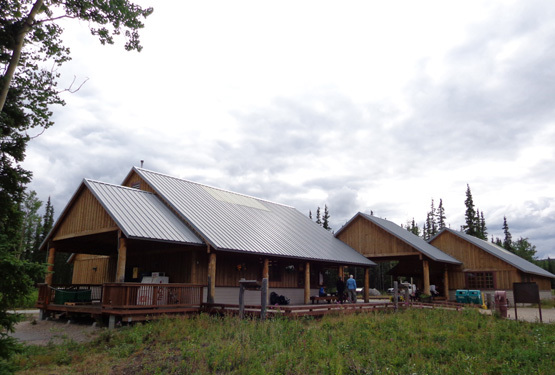 We have reservations for Riley Creek for three nights, Teklanika River for four nights, and back at Riley Creek for one night before we leave Denali National Park. You wouldn't believe how long it took us to decide when/where we'd stay before making reservations last December! So far we're very happy. 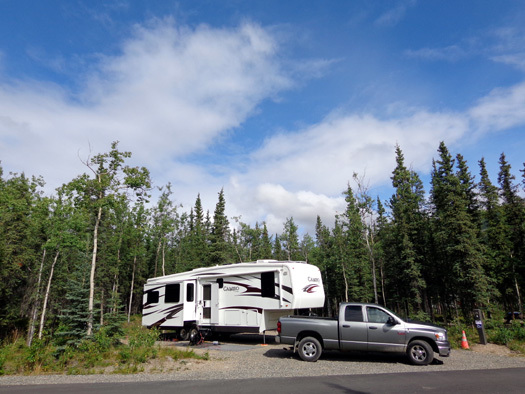 We haven't seen the other campgrounds at Denali yet. I'll write about Teklanika River AKA "Tek" while we're there. 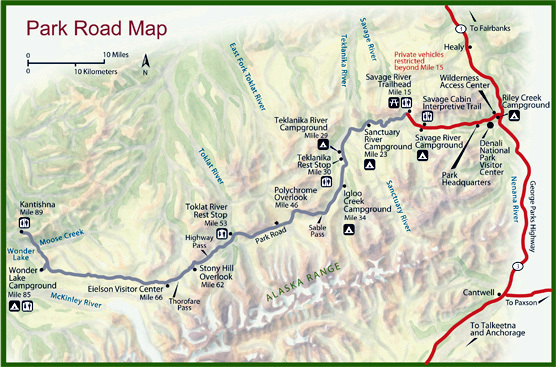 Denali NP has a total of six campgrounds of varying size and distance from the "front country" near the park entrance. There are lots of sites for tents and little RVs. There are a very limited number of sites for campers up to 40 feet long, so we didn't have a lot of choice when we made our reservations. That's why we made them the first possible day, December 1 of last year. Note that reservation policies also differ for the different campgrounds. 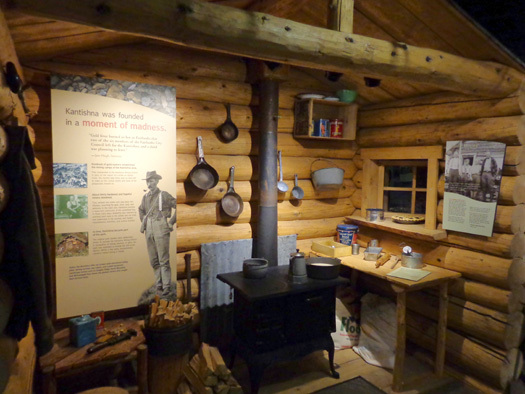 discovery hikes, sled dog demonstrations, and other activities for visitors to enjoy. 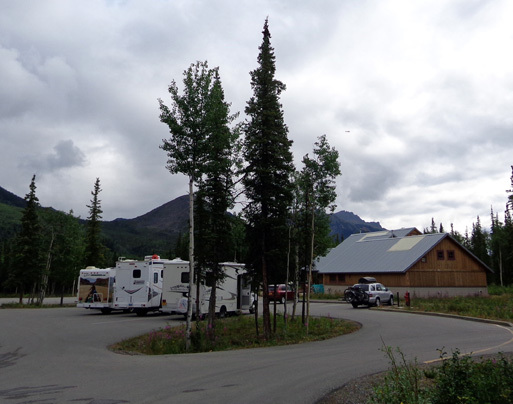 Riley Creek is the largest campground (147 sites) and it has the most sites for larger RVs. It's also closest to the entrance and all the services and trails in the "front country." We thought that'd be a good place to start while we're learning more about the park. 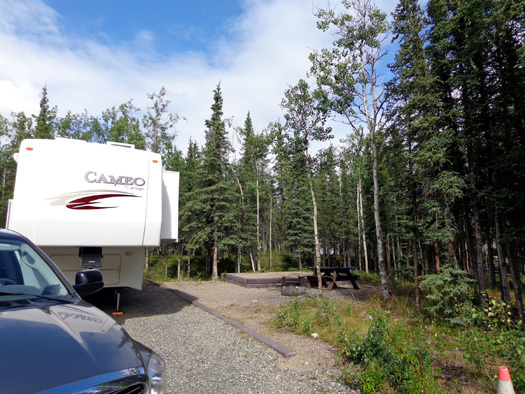 Savage River Campground (at Mile 13 on the park road) might have a few sites large enough for our camper but we chose Teklanika River at Mile 29 instead for four days during our eight-day stay. Except for some lucky road lottery winners in the fall, visitors are permitted to drive their own personal vehicles back only 15 miles on the park road to Savage River -- the part of the road shown in red above. To go farther (the road shown in blue above) they have to take a tour or shuttle bus, walk, or ride their bicycle. 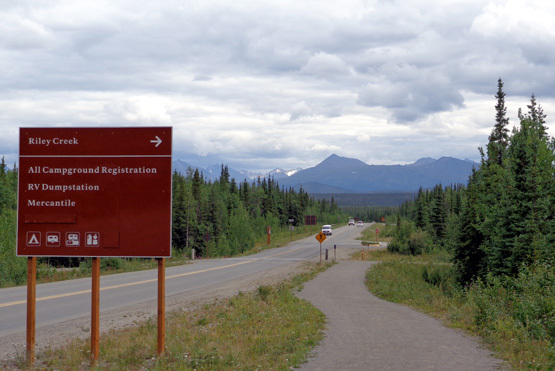 An exception is Teklanika River Campground. People with reservations at Tek can drive their RV back to the campground at Mile 29. They must stay there a minimum of three nights and must leave their vehicle(s) there the entire time. Actually, it's not. 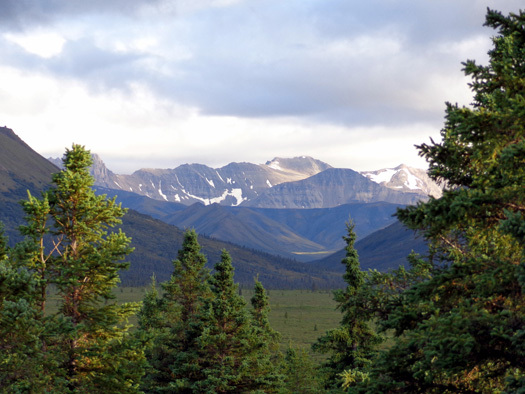 The big advantage is that folks staying at Teklanika River CG can purchase a "Tek Pass" for an unlimited number of shuttle bus rides into the interior of the park -- for the price of just one ride. To take full advantage of this opportunity they need to make a reservation for the first full day they are at Tek. After that, they can just hop on any bus with available seats going outbound at Mile 29; there is a bus stop at the entrance to the Tek campground. The pass is good only for the number of days they are camped at Tek. Not only do we save a bunch of money on tickets, we also save the time it would take to ride the buses 29 miles from the park entrance to Tek -- and back. We'll see that territory when we drive the Cameo out and back to the campground next week. 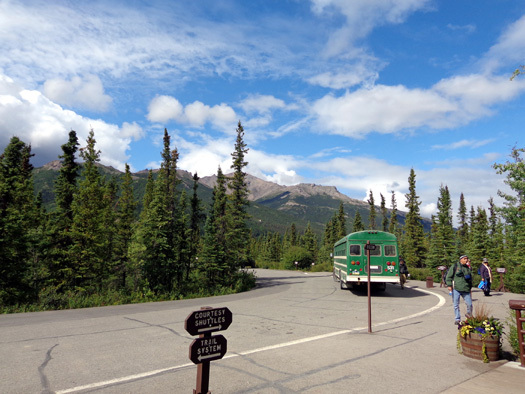 When we're at Tek we'll just hop on the first bus with empty seats at Mile 29 near our campground and enjoy the ride as far back as we paid for (Mile 85 at Wonder Lake, in our case). You can read more about the other campgrounds here. There is also a link to information for back country camping for hikers on that page. 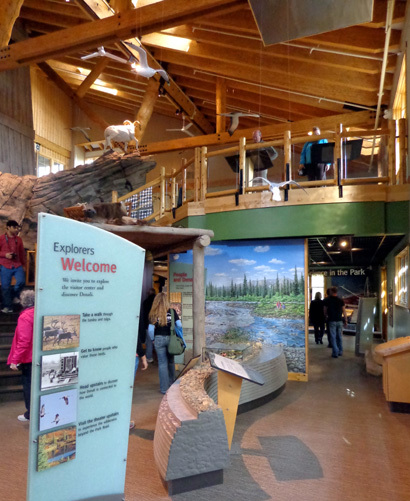 The building is attractive inside, similar to a park visitor center. 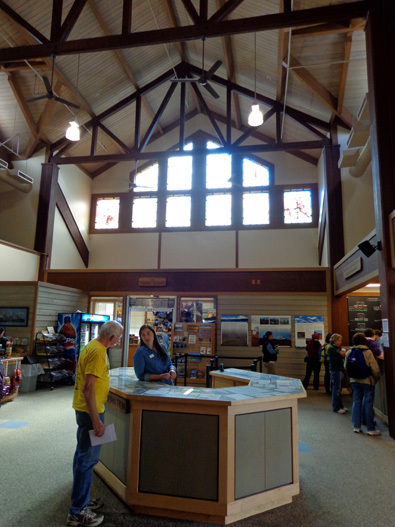 There is an information desk, lots of informative panels to read, ticket reservations area, gift shop, coffee cart, back country information center for folks who are back-packing in the wilderness, and a theater. We watched an interesting 17-minute film called �Across Time and Tundra� about the plants, animals, weather, etc. at Denali. There are other films, too. I wandered around the building taking pictures and reading interpretive panels while Jim was asking more questions about the shuttle bus system (photos above). 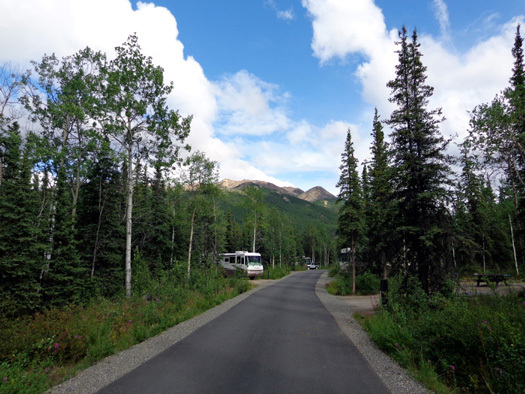 We ordered our shuttle tickets (Tek Passes) when we reserved our site at the Teklanika River Campground in December. We received the actual tickets at the Mercantile this morning when we got the pieces of paper for both Riley Creek and Teklanika River with dates in/out that go on our campsite posts. Even though we'd read everything on the website about the buses, we still had questions such as which buses can carry bikes. Jim plans to do a lot of cycling on the park road and he'll probably want to hitch a ride out or back from Tek so he can do different segments of the road. I mentioned earlier that the only access to parts of the park past the Savage River at Mile 15 is by various types of tour and shuttle buses. Figuring out which bus to take where and when is an art. 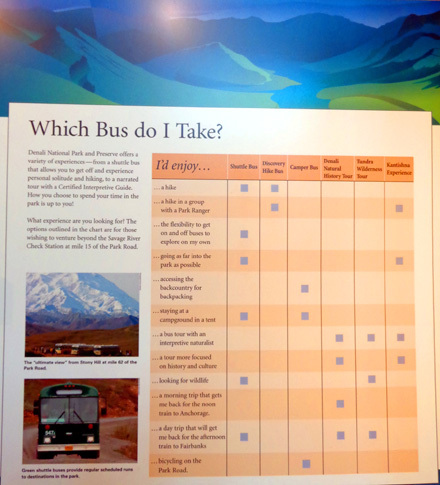 There are so many options -- before the buses fill up -- that choosing can be a bit overwhelming, especially if you've never been to the park and don't really know where you'd like to go. If you wait until you're there, your options are going to be much more limited than they are months in advance of the busy summer season. I can't explain the whole system here. After we've done one or more bus trips into the park I'll give details about our experience that may be helpful to other visitors. 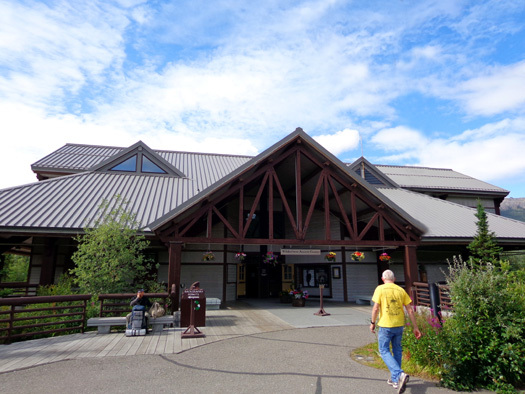 Note that there are three types of free courtesy shuttle buses that transport visitors between the various front country buildings (visitor center, Wilderness Access Center, bookstore, restaurant, train depot, etc.) and other places along the road out as far as Savage River at Mile 15. They stop at a lot of places and do not require reservations; just be at a bus stop when one of the courtesy buses is due and you don't have to drive your own vehicle anywhere. This is especially good for folks who arrive at the park with no vehicle (on a Princess tour bus or the Alaska Railroad, e.g.). If you're planning a trip to the park do most of your homework on the park's website. This page has general information about the bus system and links to more details. This was a typical summer day with most of the buses filled to capacity. The parking lot was pretty full when we got there about 3 PM. Many of the buses don't get back until late afternoon or evening. This afternoon Jim also rode his bike and I took a hike on the McKinley Station Trail, which runs from near our site down to Riley Creek, under the Alaska RR bridge (there is a RR depot near the visitor center), and back up to the visitor center. I'll talk more about the trail and Jim's ride in the next entry. 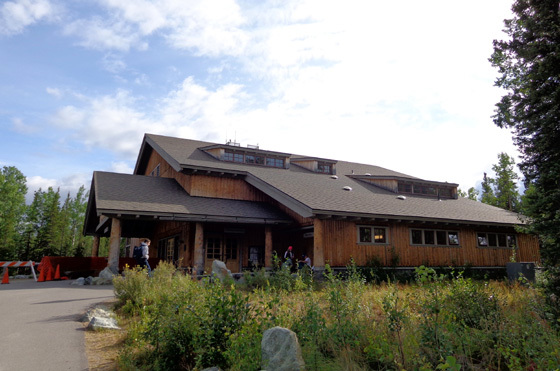 For now, I'll show you the visitor center and nearby buildings. 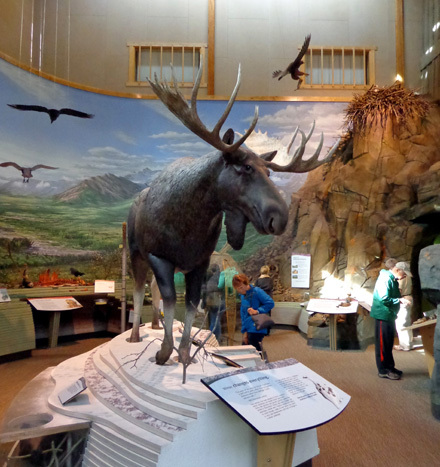 Since I came off the trail at the rear of the visitor center I went inside to see what was there -- a lot. I need to go back and spend more time there when Jim finds some time to go. 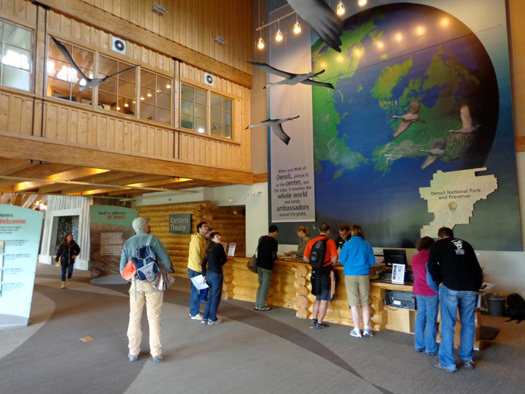 This is the rear entrance to the visitor center, which opens to the lower level. Stairs (and elevators) lead to the upper level. When I came out the front of the visitor center on the upper level I could see over to another handsome building that houses the . . . 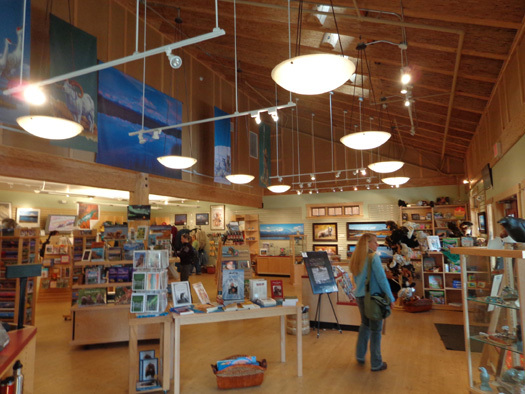 I mentioned in an earlier entry that the national parks and wildlife refuges in Alaska have partnered with an organization called Alaska Geographic, which produces numerous books, maps, calendars, photos, clothing, mugs, and other useful and gift items for the park service. 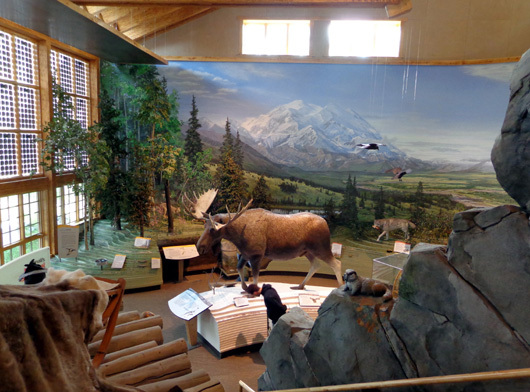 Most of the items are unique to each park or refuge. The bookstore is on the left, Morino Grill on the right. I'll definitely be going back there. At minimum I want to purchase a calendar, box of photo cards, and more of those delicious dark chocolate bars they sell. I didn't want to carry them while I was hiking. I still had about a mile to walk back to the campground and I wasn't wearing my backpack. When I left the bookstore curiosity got the best of me. I followed the painted paw prints on the sidewalk past the restrooms (I highlighted the prints here) . . .
Keep following the prints under the canopy . . .
at least 30 minutes before each demonstration. There is limited parking at the sled dog demo area so people must ride the free courtesy buses to the demonstrations (buses are wheelchair accessible). The demonstrations are also free and last about an hour. 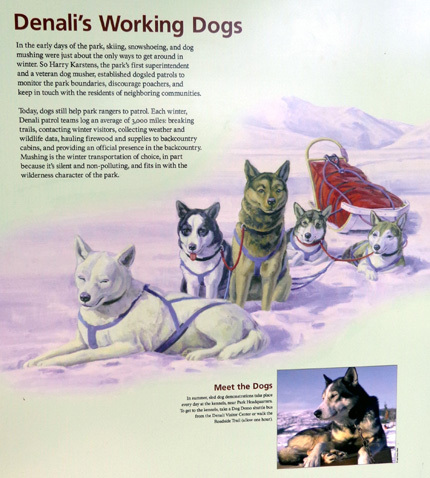 Before and after the rangers introduce a team of sled dogs and talk about the history of Denali's working dogs, visitors are allowed to walk through the area where the dogs live. After the show, the buses return visitors to the bus stop in the guest services area. Dog lovers that we are, this is high on our list of things to do while we're here so look at the topics page periodically to see when I've written a report on this topic. Since we don't plan on taking a train ride while we're here, I have no idea what the train schedule is. I'm sure interested parties can find that information on the internet . . .